PHILADELPHIA — Thanksgiving should be a daily attitude rather than an annual observance, according to an American Indian leader in Pennsylvania. A devout Catholic who fully embraces both her faith and her Cherokee heritage, Red Feather noted that many Native Americans do not observe Thanksgiving for several reasons. 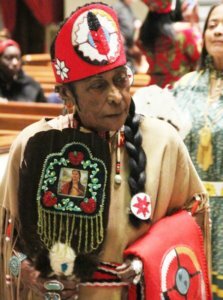 Gratitude, continuously expressed, is already integral to American Indian cultures, so a single — and often highly commercialized — commemoration is regarded as a “false celebration,” she told CatholicPhilly.com, the news outlet of the Archdiocese of Philadelphia. In addition, the U.S. holiday’s origins recall the deeply conflicted history of relations between American Indians and immigrant settlers. In 1621, European colonists at Plymouth — located in what is now the state of Massachusetts — gathered with several Wampanoag Indians for a harvest feast that later inspired days of thanksgiving in various states. A national holiday was established by President Abraham Lincoln in 1863. Red Feather’s own family was almost wiped out during the Trail of Tears, the federal government’s forced relocation during the 1830s of Indians in the southeastern U.S. to territory west of the Mississippi River. An estimated 100,000 indigenous residents were driven from their homes, with approximately 15,000 perishing en route. The effects of earlier European contact continue to impact American Indians, who currently experience disproportionately high levels of poverty, disease, suicide, violence, addiction and marginalization. Despite such daunting challenges, indigenous cultures remain vibrant, demonstrating their “persistence, creative adaptation … and resilience,” according to the National Museum of the American Indian. “The history of the relationship of our country with native people is a mixture of sadness, misunderstanding and even hope,” Archbishop Chaput said. The recent midterm elections provided two examples of such optimism, as Sharice Davids of Kansas and Deb Haaland of New Mexico became the first two Native American women elected to Congress. Facing the future while holding onto one’s heritage is essential, Red Feather pointed out. “We are trying to always remember the past, but not live in the past,” she said. She also emphasizes the need to pass on faith — and a deep sense of gratitude — to the next generation, especially as the Christmas season begins.